With an all new physics based fighting engine, new physics driven animations, truly unique and differentiated boxer styles, and the most impressive boxer roster ever including the return of the legendary Iron Mike Tyson, “Fight Night Round 4” takes video game boxing and fighting to an entirely new level. EA SPORTS Fight Night Round 4 is truly the return of the champ. Building off Fight Night Round 3, one of the best-selling and most critically acclaimed games to come out at the onset of the PlayStation 3 hardware launch, Fight Night Round 4 promises to be equally as groundbreaking and revolutionary. 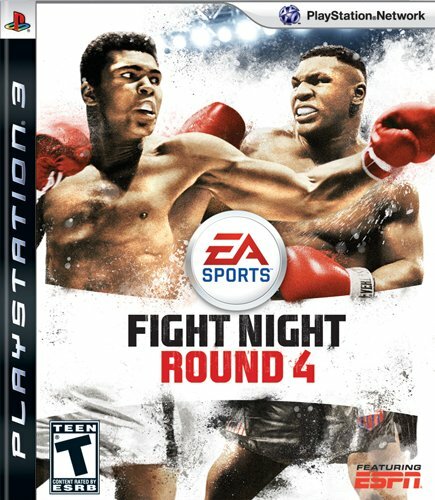 With an all new physics based fighting engine, new physics driven animations, truly unique and differentiated boxer styles, and the most impressive boxer roster ever, including the return of the legendary Iron Mike Tyson, EA SPORTS Fight Night Round 4 takes video game boxing and fighting to an entirely new level. Rivalries both old and new. Fighters from different eras & weight classes. Featuring a dramatically improved physics engine, Fight Night Round 4 brings players closer to the sweet science than ever before. Through these upgrades fighters are rendered more vividly than ever and action is animated as it happens, meaning that not only are no two rounds the same, but no two punches are the same either. This variety in punches is most evident at the point of impact, where players will see everything from the sweat splatter of devastating shots, to the energy-sucking effects of solid body blows and the virtual lack of impact glancing blows may have on a determined opponent. But when enough of any punches land the damage system built into the new physics system will allow players to clearly see the impact on opponents exactly when and where you hit them. A bloody nose or lip, a cut or swelling over the eye, a bruised forehead or shoulder; players will see them all, and it’s their choice whether to take advantage and go for the stoppage. In addition, the improved physics also makes for a significantly faster gameplay experience. Along with the game’s controller and overall movement tweeks this allows player’s to string together punches into devastating combinations. Although a single punch still has the potential to take down a rival, just as in real boxing match, combinations and the ability to avoid them are the key in Fight Night Round 4. As in real boxing, where height and reach have advantages and disadvantages depending on your opponent and your skill, Fight Night Round 4 forces players to use their fighters’ physical characteristics and styles to their advantage, or suffer the consequences. these consequences come by way of fighters ability to now fight effectively in close, as well as from a distance. For example, shorter fighters are often faster than taller opponents and tend to do better on the inside against taller fighters, but they must get inside first. If they choose to fight at a distance, the advantage is lost. Similarly, height and the assumed longer reach that goes with it is a sizable advantage, but only if a fighter “fights tall,” that is stand up straight and utilizes the jab and other punches to maintain the optimal distance to from opponent that allows him to hit and not be hit in return. Slouch and/or abandon the jab, and the reach advantage is lost. In addition to the traditional Heads Up Display (HUD), which has always provided Fight Night players with a visual representation of the changing health and stamina or their fighters, Fight Night Round 4 adds blocking to its HUD. Designed to both provide an ongoing way to monitor your fighter’s ability to defend himself when not punching and facilitate action during rounds by encouraging players to develop additional defensive and offensive skills, blocking is yet another realistic addition introduced by Fight Night Round 4. When players lose the ability to block punches they can not avoid punches thrown by opponents and must go on the offensive or take the punches. Blocking ability, as well as health and stamina can be replenished between rounds by assigning points accumulated for action in the ring to any of the three physical states/abilities. Fight Night Round 4 features a large roster of fighters from multiple eras and weight classes. Made up of more than 40 fighters this elite group provides players with the ability to not only relive past and current rivalries, but to also create new ones across time to solve the question of who is really the greatest of all time. Just a few of the fighters that players can expect to take into the ring include: Mike Tyson, Muhammad Ali, Joe Frazier, George Foreman, Roy Jones Jr., Manny Pacquiao, Lennox Lewis, Sugar Ray Leonard, Winky Wright, Eddie Chambers, Ricky Hatton, James Toney. Physics Based Gameplay Engine – No fight will be the same with an all-new physics-based gameplay engine that recreates the full spectrum of true-to-life punch impacts, giving boxers a devastating arsenal of punches, blocks and ring movement. the new physics system allows for missed punches, glancing punches, knockout blows and for the first time ever, rough and tumble inside fighting. Realistic Boxer Styles – Fight Night Round 4 emulates the styles of history’s greatest boxers like never before. Pressure your opponent with the brawling inside style of young Mike Tyson, bobbing and weaving to set up powerful hooks and uppercuts. Capitalize on Muhammad Ali’s reach, hand speed and fleetness of foot to bewilder your opponent with lightning fast jabs and straights from the outside. Extensive Boxer Roster – the greatest of all time, fighting in their prime. Fight Night Round 4 lets you create fantasy matchups, such as Tyson versus Ali, and finally settle who is king of the ring. With a boxer roster spanning both history and modern times, the matchup possibilities are endless. Online Support Through PlayStation Network – Fight Night Round 4 features full PSN support including 2-player multiplayer options and PlayStation trophies. Legacy Mode is Fight Night Round 4‘s career mode. Through it players develop their fighter from the ground up, starting in amateur competition which progresses into a career as a pro and may even include steps up or down into multiple weight classes to take on new challenges. Within this mode players can either accept the fights made for them, or create their own schedule of opponents. Either way, the goal is to rise in the ranks from contender, to champ, hall of famer, superstar and eventually the greatest ever. To do this players must not only win their bouts, but gain popularity and additional prestigious matches by winning them convincingly. New ‘Legacy Mode’ that allows players to grow the career of fighters from their amateur days to the top of the professional ranks. All-new physics-based gameplay engine that recreates the full spectrum of true-to-life punch impacts, giving boxers a devastating arsenal of punches, blocks and ring movement. An updated heads-up display (HUD) that adds blocking functionality to the existing health and stamina status meters on screen. Realistic boxing styles based on fighters like Ali, Tyson, Frasier, Foreman that allows players to step into the ring and emulate the move of the greats of the Sweet Science. 2-person multiplayer functionality both locally and on PSN, and PlayStation trophies online. Intense Boxing Action I’m new to the series so I never got to try the button option I’ve read so much about. The analog control system is smooth and intuitive and allows you to easily land high, mid and low jabs and other devastating blows with ease . In the heat of the battle you can really get to wailing on your opponent.With my large hands it takes some practice to get used to pushing the blocking and leaning buttons up top. I tend to forget on occasion and hold my index fingers straight out, mainly because I’m about to fall off the edge of my seat trying to anticipate punches.I’m a LONG time gamer, and I’ve got to say this is one of the most intense games I’ve ever played. It has beautiful graphics, outstanding sound effects and action that doesn’t let up. I love when you take a serious hit and your heart starts thumping and your ears start ringing. It’s so awesome!Getting up from a K.O. is serious business as well. You’ve got to bring yourself up off the floor and maintain your balance while doing so, again in a totally intuitive manner using both analog sticks.This is the first game which I feel I’ve got the value of what I paid out of it – and I’m still fairly new to it! It’s easy to justify owning a copy of Fight Night Round 4. Highly recommended! True Fan of FNR3 and total control Let me start by saying that I have always been a fan of the FN series and I fell in love with FNR3 even though it has its fair share of glitches. I have always used total control and never enjoyed button mashing but I agree that FNR4 got it backwards this time around. True the graphics look great, the game play is smoother, and there are more fighters, but this game feels like facebreaker. Did EA play this game or just release it. The new total control just makes it easier to throw 100 jabs. You don’t need any strategy to play this game because half way through a fight you will find yourself just throwing jabs to keep up with the computer throwing 200 jabs (with no stamina loss). The only good thing this game is good for is watching the computer fight the computer. I never like to rip on a game just because of a new learning curve but this is ridiculous. To get the full control of your fighter you literally have to be pressing and holding all the L&R top buttons and manage to perform an unnatural thumb movement just to throw a weak hook. Everyone who says this game is great is either new to the franchise or just love no stop jabbing for 5 rounds. Come on people… that does not make a game intense and exciting to play unless your 5, but this is just my personal opinon. Very good game, strange reviewers for it though I haven’t played a boxing video game since mid ’90s.I got this one b/c it was in the sales bin & I’m cheap enough to refuse buying any game for over $35 (lately lowered to a $25 max price).While I still rate NES Mike Tyson’s Punch Out as the funnest boxing game of all time (pure fun factor based alone), this one is a very close second.I don’t see how anyone wouldn’t have fun with this game, which is the point of video games correct?… To have fun.You can pick apart any video game & find flaws so I can’t say there aren’t any, however, I can say that they’re not visible enough to take away from the fun factor of the game.I read a few of the low rated reviews & am kind of surprised.There are a lot that have 1 star ratings with the common text ‘not as good as round 3’…Ok, so in your opinion its not as good as round 3, does that warrant a 1 star review?There are a lot of games that aren’t as good as their predecessors, i.e. God of War 3, Resident Evil 5, Halo (all past part 1), Zelda 4 and up… they’re still good games.The fun factor you get for the $20 price is too much to pass up so if you’ve got $20 to spend on entertainment & you feel like playing a boxing game, I don’t think you’d be disappointed with this one. Also, replayability on sports games is always a benefit… you won’t get bored with this one.